Last night, before I went to sleep, I took one of my old photographs and tweaked it for more detail and shine and impact. It was a photo of the Nichlaus Building on State Street in Schenectady – the building that, when the neighboring Olender Mattress structure was demolished, revealed a nearly pristine ghost sign on its facade. The Ghost Sign on State and Erie. Nikon Df camera, Vivitar 19mm f/3.8 lens. Photo (c) Chuck Miller, all rights reserved. First off, if you’re a ghost sign aficionado, you can surmise that the advertisement on the building has partially disappeared. This would have said “Uneeda Biscuit,” a Nabisco cracker-like confection. There are still some Uneeda Biscuit signs in Albany and in Troy, but they’re very hard to find and even harder to read. Unfortunately, in knocking down the Olender Mattress building, someone accidentally loosened or damaged one of the load-bearing walls for the Nichlaus Building, the one with the Uneeda Biscuit sign. 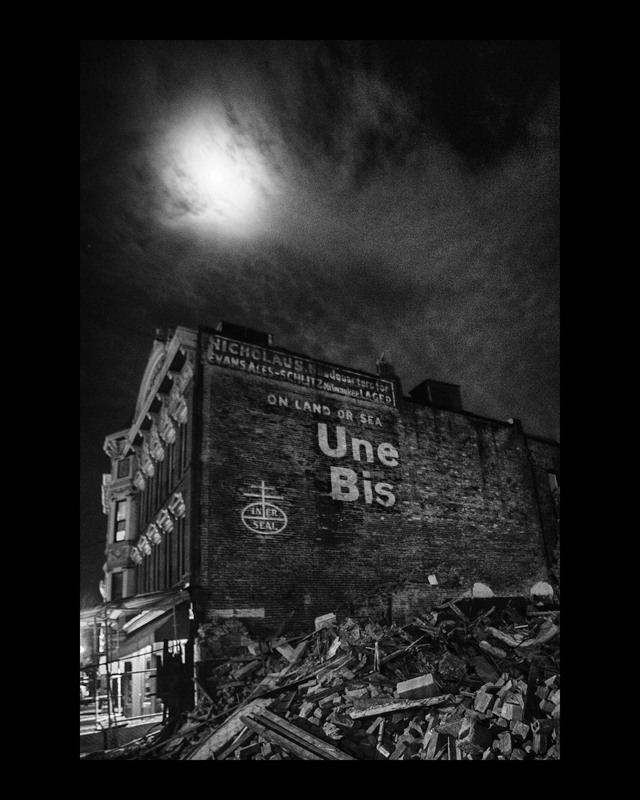 About a year after this ghost sign was revealed … the Nichlaus Building had to come down as well. Today, there’s a new structure on the corner of State Street and Erie Boulevard. And it does NOT contain any ghost signs on it, Uneeda Biscuit or otherwise. I thought about a few things regarding this picture. Do I want to enter it in competition? Is it worth entering in competition, even in this flipped-over black-and-white construct? Does the cloudy moon above the building offer importance or does it take away from the picture? I can save it for 2019’s BUILT, the Historic Albany Foundation’s charity fundraiser, which features art based on Capital District architecture and history. Because, honestly, who wouldn’t need an extra Uneeda Biscuit in their life? Or even a Une Bis?